Meme Potential: 5.0. Decking the opponent by looping two of these sounds amazing, and I will certainly be trying to win based on that. 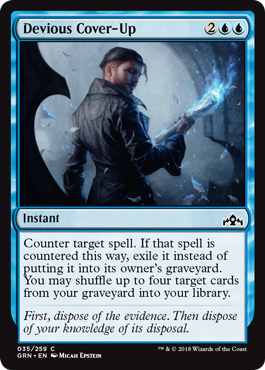 As for this card without those shenanigans, it’s a lot less devious, and more clunky—a 4-mana counterspell isn’t really where you want to be. Counterspells get much worse the more mana they cost, and 4 is enough that you really get punished when you leave it up and don’t get to counter something. I’d basically only run this if your opponent has a bunch of insane expensive spells or if you really are going for the decking achievement.